Almost three years ago, my friend Randy Hetherington (ears extraordinaire of Midtown Recording) called me and invited me to a studio jam session. I was not unfamiliar with collectively improvised music; I had played in a few bands and performances of this nature in the past. I knew it would certainly be fun! Through this session I first met J.D. Hopkins. This recording became a part of Family Values, and my meeting with J.D. began a long chain of CD releases, performances, and promotion that continues to grow. One thing has been certain for me since the beginning: I love playing this music. As a musician that has studied and played a variety of styles (jazz, rock, funk, reggae, latin, world-beat, country, folk, etc., etc...) I have learned to both 'play to the sound' and step out of the boundries. When presented with a form of music that has few boundries, I welcome the opportunity to stretch out and experiment with my second language, music. J.D., his sons and his group have allowed me and all of the band's musicians to seek and surpass their best. The latest example of this can be heard on the new live CD Live at Forward Hall. Music of every nature results, from World to Funk to Swing to Rock. Moods are created and evolved, and dialogues are explored between the performers. All of this takes place in a live setting, with an appreciative audience sharing in the creativity. Recorded in the cold month of February of 2004, the production moved slowly through a summer of more recording and performing, but is now complete in the seventh double CD from J.D. and the Sons of Rhythm. Five percussionists, four bass players, four guitarists, two guitar-synth players, and one keyboard player (some of these are the same person) all created the music on this album spontaneously and collectively. I have really enjoyed the result. As the maker of the CDs, developer of the artwork and packaging, and web-presence developer, I spend a lot of time listening to the CDs as they are being released. I believe you will find much to explore in this new recording. The great thing about creating music this way is that it bears repeated listenings very well. There is always something new to find, some new way to relate to the sounds, and some new experience awaiting a fresh listen. So dig in, and have yourself a copy of J.D. and the Sons of Rhythm: Live at Forward Hall. You will be glad you did. J.D. and the Sons of Rhythm played host at three concerts in Erie, and played first jam at an annual birthday party celebration in Meadville over the summer months, bringing their collective improvisation to the live arena once again. Erie's Forward Hall was the site of the series of concerts this summer, displaying some of the area's finest musical talent together on one stage. The regional mainstay Cat's A Bear shared the stage for all three shows, presenting their unique brand of original jazz with J.D. members Frank Singer and Tony Stefanelli joining Joe Dorris, Phil Papotnik (gig 1) and conga guru Tito for the sets. Cat's A Bear recorded all three performances, and at least one CD of material will be released. The new contemporary original jazz group Potato Battery played at the second and third shows, giving tight, exciting performances both times, with the second set recorded and being considered for release. J.D. and Sons members Mike Ohm, Sheldon Peterson and David Blaetz are joined by drummer Matt Ferguson in Potato Battery, with Ohm and Peterson writing most of the material for their performances and their debut self-titled release. J.D. Hopkins mentor Cootie Harris celebrated his 82nd birthday in his usual style, with an annual party and jam session. Cootie taught many of the drummers and martial artists in Meadville for many years, and has left his mark on the music scene in the region. Many of those who have jammed with Cootie and his students in the past attend this annual event, as well as monthly jam sessions throughout the summers. J.D. and the Sons of Rhythm performed a first set at the celebration, with J.D., Jayson and Rickie joined by Frank, Mike, Tony and Meadville native Joe Frisina. Mellow, open and free like the day, the music flowed easily through the rural backyard. Following the set of collective improvisation, jamming on jazz standards began, with J.D. and Sons members joining in for some 'Blues for Alice' and more. This performance was a great way to encapsulate a summer of great music. The evolution of J.D. and the Sons of Rhythm continues, and the constant challenge of new situations and configurations sharpens the reflexes of these already-skilled musicians. As winter on the shores of Lake Erie draws near, the project goes into hibernation, organizing the next two releases, promoting the new CD Live At Forward Hall, and preparing for more studio work and potential future live shows. Much more is brewing. Stay tuned. The Next Round of CDs Begins! Since the virtually simultaneous release of Imagination Doctors and Smoke Shadows almost a year ago, J.D. and the Sons of Rhythm have not released any new music on disc. These albums ended a cycle of releases that included six double-disc CDs of collective improvisation. The diverse group of musicians have been creating and recording a great deal of music, both live and in the recording studio. Now, this music is being consolidated, organized, and prepared. Look for a steady offering of releases over the next few months. First, the long awaited LIVE AT FORWARD HALL recording from February 16 is nearing completion. Some final touches are all that's left before the printing and duplication begin, and then those lucky attendees who signed up for a copy will be receiving theirs as soon as the CDs are done. This music shows many of the faces the group can display. Searing electric guitar solos and grooving swing jams flowed into funk vamps and free jazz blowing, with moments of soft probing and high intensity mixing and matching. It's all here, on LIVE AT FORWARD HALL. Before and after the February live show and recording, J.D. and the Sons of Rhythm continued to put down tracks at Midtown Recording Studio. In addition to the classic live collective improvisations that created the Sons in the first place, there is more of the layered, overdubbed music first flirted with on Primate Gestures, then presented for the entire first side of Imagination Doctors. Many of these overdub sessions took place with the percussion section consisting of Rickie, Jayson and J.D. Hopkins and Joel Polacci, all of whom played together on the first passes of each song. Guitarists Ohm and Singer did the layering overdubs, using their various sounds (including Singer on keyboards) to create different moods and themes. Some new players joined the ranks, both in the live collective improvisations and in the overdub recordings. The latest overdub session included Cat's A Bear saxophonist Phil Papotnik, who fit right in to J.D. 's 'first take' recording concept as he pleased the crew with his agility and flow of ideas. Guitarist Joe Frisina played quite a few of the studio jam sessions, and jumped in to some of the live sets as well. Joe comfortably merged his style with the band in each situation. Joe, Jayson Hopkins and Frank Singer will be recording some of Joe and Jayson's original material in the coming months, so keep your eyes open for that! Regular guest guitarist Joe Popp joined in many of the live studio sessions, as well as appearing on the LIVE AT FORWARD HALL CD. Joseph Allen Popp's Weirdo Theatre recently joined the ranks of artists releasing music recorded at Forward Hall with their CD entitled I Spy The Hootzpah: Live At Forward Hall. Music was also recorded this summer at the three J.D. and the Sons of Rhythm concerts which took place at Forward Hall. Although not many Sons sessions were recorded, Cat's A Bear and Potato Battery both have tracks to prepare for release. Potato Battery's excellent set of August 14 did not make it to disc, but their September 4 performance proved to be just as good, and the group is already making plans to release the recording. Cat's A Bear managed to get all three sets, one with Phil Papotnik on sax, and two with the quartet of Frank Singer, Tony Stefanelli, Joe Dorris and the infamous Tito, known to his friends and co-workers as mild-mannered Nick Ronzitti. There is most likely enough material to release two live CDs, and the work has already begun. Even as all of this material is assessed, mixed, organized, and prepared, more fresh and innovative music is on the horizon for this collection of creative, original musicians in the Eastern Great Lakes Region. More J.D. and the Sons of Rhythm sessions are likely, with the concept of collective improvisation being explored on new fronts as well as the continued evolution of the jam. Hiphop looks to be entering the mix as well, with Ricky Hopkins and Frank Singer (a.k.a. chelaBOP) writing and preparing lyrics and music for a joint debut release. One World Tribe is also planning their third CD, with the focus on Hiphop as well. D.J. Chilly J, Preacha' and chelaBOP have been honing their skills on live crowds in preparation during One World Tribe's summer PennPAT tour. All this adds up to a long stream of new music in a multitude of styles coming out of this cadre of musicians, with live music, original sounds, unique studio mixes and music of the streets all being explored. The mutual endeavors of Erie's Forward Hall and Midtown Recording Studio are becoming the nexus for a new creativity through the work of J.D. Hopkins and the entire staff of both joined facilities. We can all look forward to music which will surprise, delight, challenge and interest us for some time to come. The process of creating music in J.D. and the Sons of Rhythm can be described with words like "improvised", "spontaneous" and "un-rehearsed". This process is ultimately a risky way to create music, especially in front of a live audience. To contrast this playing style with groups who are tightly rehearsed and present their material in a more traditional format only serves to point out these inherent risks. With two shows done and another scheduled for Saturday, September 4, J.D. and Sons have clearly thrown caution to the wind and included two exceedingly tight bands in this summer concert series at Forward Hall. Potato Battery closed the night last Saturday (August 14), rocking the house. More on this evening's performances by all three groups will appear in future articles. On July 3, Cat's A Bear opened the evening with their quintet format. The core trio of Cat's A Bear includes principle composer Frank Singer on guitar, Romolo-Chocolate master Tony Stefanelli on fretless electric bass, and the dynamic and powerful Joe Dorris on drums. Phil Papotnik added his popular saxophone voice to the mix, and Forward Hall was blessed with the presence of Tito, master conga player and leader of the Tito Revolution (or at least the search...). The group presented five originals by Singer, beginning with the title-track of newly-re-released Eye of the Pyramid. This medium funk groove saw the band flexing their muscles and warming up their chops in preparation for the evening. It Don't Mean A Lick If It Ain't Got That Nick followed, a tritonic medium-up swing which begins its tight arrangement with a unison melody that returns throughout the song. Tito played the first solo on congas, followed by solos from each member as is their typical format. Bass featured prominently in the medium funk tune TCFW, with Tony filling in the open sections of the melody arrangement, and taking the first solo in the more modal solo section. Singer began the solo rounds in the eleven/four swing tune Blazz, written in 1984 and still sounding fresh and advanced today. The set closed with the up tempo barn-burner It's Always Something, leaving the audience excited and ready for more. More was what they got, as J.D. and the Sons of Rhythm took the stage for their set. The percussion was handled adeptly as always by the Hopkins family, with Rickie Hopkins on traps and J.D. and Jayson Hopkins on electronic drums. Regular guitarists Mike Ohm, Sheldon Peterson and Frank Singer were joined by guest guitarist Joe Frisina. Cat's A Bear bassist Tony Stefanelli handled the first part of the evening, surrendering the bottom of the groove to Kenny Cornelius for the second half. Contrasting the tight and punctuated arrangements of Cat's A Bear, J.D. and Sons' free-form collective improvisation flows in an entirely different way. 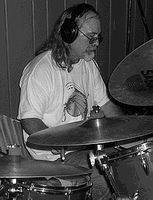 Typically the songs are generated from the foundation of the drum groove, with J.D. often laying down a pattern that sets the music in motion. Bass and guitars then begin to set the tone for each piece, focusing on keys and modality to harmonic and melodic language for the exploration. This night was no exception, as the music moved from tribal world-beat to urban funk to wide-open Americana. Grooves were established and complimentary parts were created, and then these strong soloists took turns leading the party in diverse and exciting directions. Ohm led the pack out of the gate most often, playing sweet singing melodies and fast intricate lines, and setting the standard high for the other players. Peterson soloed in a harmonically dense, rhythmically asymmetrical style unique in sound and character. These two guitarists often created together, showing their familiarity as half of Potato Battery. Singer contributed a variety of synthesized sounds, including trombone and keyboards, with guitar solos showing his speed, flow of ideas, and blues-rock sound honed by Bebop and modern jazz. Grooving and soloing on the same side of the stage, Frisina held his own in unpredictable waters, contributing harmony and musical conversation with the group. Together these guitarists improvise the harmony and melody of J.D. and the Sons of Rhythm. Bassist Stefanelli and Cornelius created their usual seamless transitions and firm foundations for the group. The fretless sound of Stefanelli's has a lyrical quality that can feel melodic even as it grooves, and his soloing shows a depth and fluency of technique that is only used when needed, but always available. Cornelius brings a funkier, more active approach, typically choosing to drive the band a little harder rather than solo, capable though he is when the time comes. The namesakes of the group, J.D. and his sons Rickie and Jayson showed their mastery of the art of three percussionists playing together. As J.D. grooved, son Rickie pumped the beat out on the trap set, playing in a free, transformational style that showed his listening skills are as refined as his technical skills. Son Jayson added sounds tastefully and awarely, bringing the sound to life with details and punctuation. Together they created the textures and the overall form of the music, often through the guidance of J.D. 's playing. After working hard at making a joyful noise, the evening came to an end. Forward Hall had once again provided a unique night of music, and Midtown Recording Studios had captured the Cat's A Bear performance on disc, to be edited and released in some form in the not-too-distant future. J.D. Hopkins has provided for all of this music, and has brought new sounds into the world. He has also supported the local and regional music scene in Northwestern Pennsylvania, and this summer concert series is one more example of this. Once pictures are edited and tracks are listened to, last Saturday's exciting performance by Cat's A Bear, J.D. and the Sons of Rhythm, and Potato Battery will be presented in an upcoming feature article. Next up is the performance on September 4, with all three bands at it once again. J.D. hopes to see you there! Creativity may very well be the greatest power in the universe. It certainly drives artists Sue Buck and J.D. Hopkins and the artists and musicians they have gathered to them. This creativity was in full attendance on Sunday, June 13, 2004 at the Erie Art Museum Annex. Sue and J.D. were joined by a number of regional visual artists, including J.D. and the Sons of Rhythm performers Jayson Hopkins and Mike Ohm, Weirdo Theatre's Joe Popp, and Quantum Events cover photographer Jordan Hopkins. On display were photographs, paintings, collages, and drawings. Included in the works were some of the original art used in the J.D. and the Sons of Rhythm, Mike Ohm, and Potato Battery CD covers. While people browsed the artwork, music performances took place on the Erie Art Museum Annex stage. Opening the afternoon's music, Joseph Allen Popp's Weirdo Theatre presented cuts from their upcoming album, I Spy the Hootzpah, as well as other works in their repertoire. The combination of spoken word, musical themes, and group improvisation create a powerful and innovative ensemble presentation. This all-original group includes Theremin player Rob Gray, drummer Rick Lopez, guitarits and J.D. and the Sons of Rhythm guest performer Joe Popp, and member Kenny Cornelius. Bassist Cornelius continued adding his fast funk flavorings as J.D. and the Sons of Rhythm took to the stage for the first of their two sets. Splitting and sometimes sharing the bass chair during the evening was Tony Stefanelli. Together they provided the pulse and foundation with electronic percussionists Jayson and J.D. Hopkins, and trap-set player Rickie Hopkins. Guitarists Mike Ohm, Sheldon Peterson and Frank Singer contributed the harmony, melody and intensity, joined by Joe Popp at the end of the second set. The collective improvisation flowed through the evening, with moments of Funk, World Music, Free Jazz, Hip Hop and Rock merging and converging to create this unique sound. The vitality of the jamming kept music coming from beginning to end, and made for a delightful Sunday afternoon for audience and presenters alike. Another Buck/Hopkins Art Show is planned for the fall of 2004 which, as this show did, will include performances by Joseph Allen Popp's Weirdo Theatre and J.D. and the Sons of Rhythm. Check back for more details, which will be posted as they become available. The summer of 2004 looks to be a very busy one for the members of J.D. and the Sons of Rhythm. New CDs are out, another is coming, J.D. and Sons are playing and recording live performances, and the band returns to the recording studio several times. Member groups Potato Battery, Cat's A Bear and One World Tribe are also very busy with various gigs, and several national ads will be appearing in Downbeat and Relix magazines promoting many of our CDs. J.D. and the Sons of Rhythm have two new releases. Smoke Shadows presents twelve vintage jams by the Sons, portraying the band during a tumultuous time for the musicians in the group. Intense, explorative communication is the result, with the theme of global events coloring the tone of the music. Imagination Doctors represents a departure in two ways from previous albums. First, side one contains ten vignettes created through multi-tracking overdubs from Frank and Mike over improvised rhythm jams. Second, while the previous J.D. and the Sons of Rhythm recordings contain un-edited jams, they are often started and stopped at points within longer sessions. Side two has a 46 minute jam presented in virtually complete form. Travelling its path in sound is a journey well worth taking. Band member Frank Singer just released a CD created during an earlier, electronic duo version of Cat's A Bear. The disc, entitled Eye of the Pyramid, contains eight tracks of music played on electronic drums, electric guitar, keyboard synthesizers and samplers, and run by a computer-based sequencer. All the parts are performed by two musicians, Frank and drummer Joe Dorris. Singer composed each tune, having some help from Joe and his brother William Dorris on William's Overture. Guitarists Mike Ohm and Sheldon Peterson and bassist David Blaetz play together in a group called Potato Battery. Their first self-titled release is out, and already selling very well. Their music is instrumental jazz tinged with flavors of rhythm-and-blues and rock-and-roll. Also containing all-original music, the bulk of the compositions are handled by Mike Ohm and Sheldon Peterson, and Mike recorded several of the tunes on his two solo discs, Things Are Not What They Seem and One Thing After Another. For those of you who attended the February 16 Forward Hall gig and signed the mailing list, the CD of the live recording promised to you is still in the works. Upon its completion you will be contacted through the email address you gave us at the show, so please make sure your information is current, or contact frank@jdhopkins.com to update your email address. Riding on the success of the April 23 performance and art show in Meadville, artists J.D. Hopkins and Sue Buck will show their work twice in Erie at the Are Museum Annex. Both shows will display photographs and drawings by the artists, and performances by Joe Popp's group and J.D. and the Sons of Rhythm. The dates for the shows are Sunday, June 13 and Sunday, October 3rd. Doors open at 2 pm for both shows. Forward Hall is back on the docket three times over the summer. Each gig will be recorded and made into CDs. All three gigs will feature Cat's A Bear and J.D. and the Sons of Rhythm, and the second and third show will also have Potato Battery jumping in for a set each time. These Forward Hall shows tend to be quite good, so don't miss any! Band members also hit the ground running performing with other groups. Frank has a busy summer with One World Tribe, Cat's A Bear and the Basil Ronzitti Trio. Tony joins him in Cat's A Bear, and they end up together occasionally in the Basil Ronzitti Trio as well. Mike, Sheldon and David bring Potato Battery back to Erie this summer, proudly touting their new album even as they perform new material. David also plays on Fridays at the Papermoon with Jim Madden, and Kenny joins Joe Popp for the Art Show performances. See the Events Calendar for a listing of dates and venues for each group. J.D. Records and Naked Kitty Productions have sponsored ads in Downbeat Jazz Magazine and Relix JamBand Magazine. Each ad features various J.D. and the Sons of Rhythm CDs, some with other band member's groups. Web versions of the ads include sound samples for the discs and purchase and information links for each CD. The Downbeat ad is located here, and the Relix ad is located here. All in all, we think we have a great summer ahead of us, and we hope you will join us for some or all of these great events. Most take place in Erie, some indoor and some outdoor venues. Also, new music is coming out, with more being recorded, so updating your CD collection is advised - you won't want to miss any of this great music! Last but not least, more and more people from all over the world will be finding out about us, bringing the world to Erie and Erie to the world! Join us in the welcome! For JD & Sons, One World Tribe, Cat's A Bear, Basil Ronzitti Trio, Art Show information, and CD Release information contact frank. For Potato Battery, contact sheldon or mike. April 23rd found J.D. and the Sons of Rhythm converging in Meadville for a performance at an Art Exhibition featuring the works of drummer-author-artist J.D. Hopkins, and Primate Gestures, Smoke Shadows and Imagination Doctors artist and photographer Sue Buck. The early spring day was fair and warm, with a feeling of positive anticipation towards the music to come. Tony and I enjoyed the drive from Erie, through rural fields and scenes. The Academy Theater in Meadville housed this prolific body of works, with each artist filling a wall with photographs, drawings, and a visual delight of selections. The band found itself spending free time enjoying the art. The Meadville community has always shown a great deal of support for J.D. and the Sons of Rhythm. It was a pleasure being able to socialize with them in this setting, surrounded by this beautiful art. The stage at the Academy Theater lent itself beautifully to live music. Catwalk Music provided excellent sound reinforcement, and the stage lighting crew added the final touch of atmosphere. The gentle mood of the evening reflected itself in the music. Melodic playing and worldly rhythms meshed into an evening-long groove. The rhythm section consisted of J.D. Hopkins, Rickie Hopkins, Jayson Hopkins and Joel Polacci on drums and percussion, and Tony Stefanelli on bass. Regular guitarists Frank Singer, Mike Ohm and Sheldon Peterson were joined by guest Joe Frisina, who fit right in to the free flow of ideas. This gig falls at the dawn of many changes for J.D. and the Sons of Rhythm. J.D. Hopkins and Sue Buck's works will be featured in a new section of the jdhopkins.com website, with unique works for sale. The band is releasing two new CDs shortly, Smoke Shadows and Imagination Doctors. Soon after that the live CD of the performance in Forward Hall will be released, and sent to those who remembered to sign the mailing list while they drank their free imported beer. Also on the horizon are new ads, with a second Downbeat Indie Issue spot, and our first of two in Relix Magazine. Spring, 2004 holds forth the prospect of a bright future for J.D. and the Sons of Rhythm. Many live performances are in the works, and more people are finding out about us. This can only be good for local and independent music everywhere! Performing at this Art Presentation felt like a great way to kick off that future. We would like to thank J.D. and Sue Buck for inviting us to join them, Angela Snippert for holding down the fort at the CD table, and the people of Meadville for making us feel welcome. The winter, begun in 2003 and lasting into 2004, has proven to be one of the most brutal - temperature-wise - in long memory. Cabin fever has given way to desolation, leaving Erie-ites asking: "Will it ever be warm again?". But on Monday, February 16th, the local populace took heart, and braved the cold to hear the region's finest musicians heat it up in Forward Hall. Assembling the usual suspects, with J.D., Rickie, Jayson and Joel on drums and percussion, Tony, David, Kenny and Ralph on bass, and Frank, Mike and Sheldon on guitars, the jams were under way! Quantum Events guest Joe Popp joined in during a set, and guest Alan Chaffee played some traps and electronic percussion. Randy worked hard to ensure that the recording went off without a hitch, and we are all looking forward to the release of this live session on double CD! Many guests filled the Hall, including members of bands that J.D. and Sons performers also play in. Kennedy Thompson and alumni Brad Amidon of One World Tribe stayed on, eventually drifting back to the control room of Midtown Studios to check out the recording and hang out with Randy. Joe Dorris and Tito of Cat's A Bear came down to drink up the sounds and a couple of those free imports! Many other friends and fans joined us, for which we are always grateful. With instructions from J.D. beforehand, the group kept the songs and sets shorter than usual to allow for different combinations and remove the need for extensive editing of the recording. The group set up their gear and sound-checked with the able assistance of Shawn Hammer of the Forward Hall sound staff, and the conversation began in earnest. Tony held the bass chair for the first set, laying down strong bass-lines with the grooving drums, allowing the guitars, guitar-synths and keyboards to soar over top. David played acoustic upright bass for the second set, and J.D. put in a rare appearance on the trap set, putting out swing-like rhythms with the walking bass. Kenny played set three, Tony and Kenny did set four, and Ralph the fifth, laying down his five-string bass parts focused on Rickie and the groove except when Jayson jumped on the traps for a spin. The last set began with Kenny, Mike, Frank and Rickie doing the customary power jam, and, on J.D. 's cue, he, Sheldon, Jayson and Joel came up to finish out the night. Angela held down the fort at the sign-up table, gathering the names and addresses of those that will receive the recording. After those lucky ones get their copies, the CD will become available for sale on the Web site. This evening turned up the heat in Erie, bringing a bright spot in this wearying cold spell. Those in attendance carried home the warmth, and the recording will show that the heat lives on forever in digital sound. THIS EVENT WILL BE RECORDED LIVE! Come, sign our mailing list, and receive two free imported beers and a CD of the live recording!